Plaza Las Fuentes, located just east of City Hall, is one of the more under-appreciated works of architecture in Pasadena. 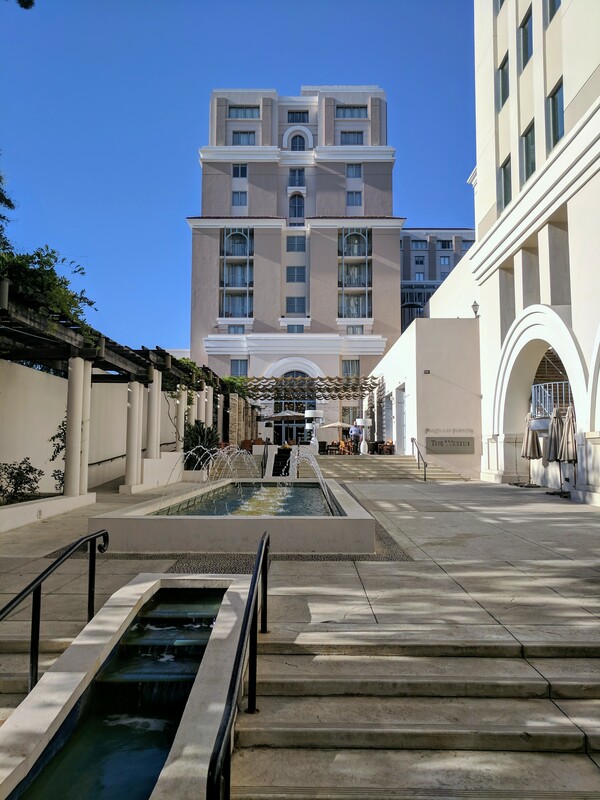 Although Plaza Las Fuentes’s 8-story 360-room hotel and adjacent office tower are two of the taller and more massive buildings in the city, they slip into the Civic Center quietly with a comfortable grace. Much of this comfort – which is architectural but also tactile – is derived from a masterful site plan, organized around a series of public courtyards, gardens, fountains, terraces, arcades, and lobbies. Interlinked and interlaced, this open space sequence incorporates a landmarked church and aligns westward towards the City Hall courtyard, extending a pedestrian promenade that continues under the City Hall dome into the City Beautiful-styled Civic Center planned by William Bennett in 1925. 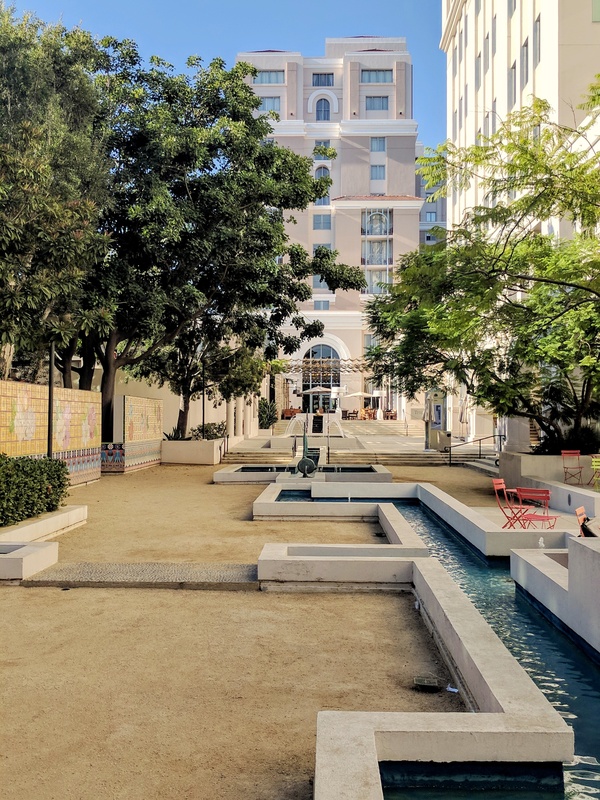 As imagined by Charles Moore and Lawrence Halprin, Plaza Las Fuentes is not only a masterful urban design accomplishment, but also a wonderfully joyful and comfortable place within the city. 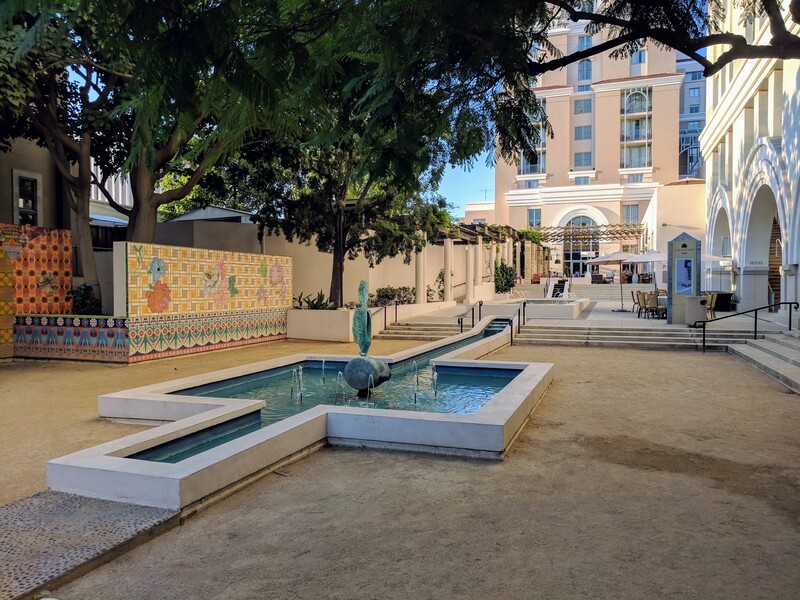 The Lawrence Halprin-designed gardens extend the axial alignment from City Hall, with ever-so off-axis fountains and water channels, punctuated with playful sculptures by Michael Lucero and colorful ceramic tiles by Joyce Kozloff. The gardens and Moorish-inspired water channels turn north, rising to meet the office and hotel towers. The peek-a-boo views revealed, hidden, then revealed again by the landscape and terraces could be drawn from Gordon Cullen’s Townscape studies. Terraces from the hotel restaurant and meeting rooms overlook the gardens, connected to the ground with wide stairways under trellises and archways. The garden sequence continues through the building as the two-story hotel lobby, where decorative wood arches echo the exterior arcades. 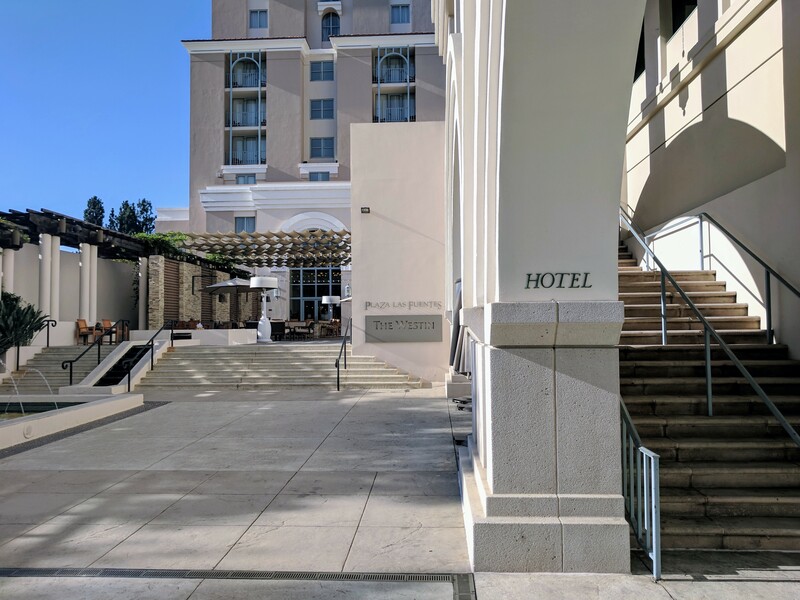 The lobby opens to a porte-cochere drop-off facing Los Robles Avenue, which of course serves as the front door for most hotel guests. A deep arcade lines the Los Robles Avenue façade, punctuated by mid-block passages to the interior garden. 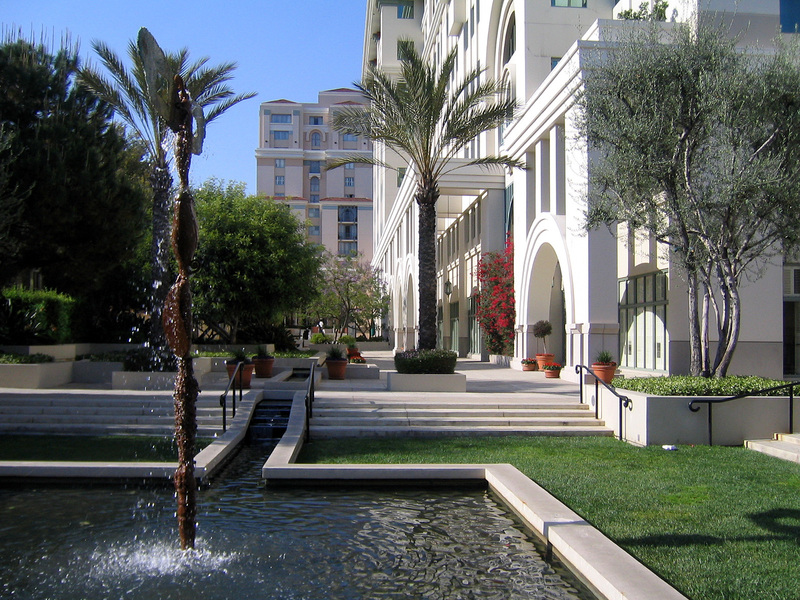 The view back to City Hall from Los Robles Avenue is framed by an appropriately symmetrical layering of architecture and landscape – a reverse archway, created by a monumental gap within the street arcade, pairs of palm trees, and the fountain within the central courtyard. More subdued and less colorful than other Post-Modern architecture of the time, Plaza Las Fuentes still feels remarkably current. The public spaces woven through Plaza Las Fuentes do much to disguise the fact that the buildings essentially large plaster-clad boxes, albeit sensitively composed and arranged boxes with Post-Modern arches, balustrades and other features. The lesson is two-fold. One, the thoughtful arrangement and appointment of public space can mitigate large buildings. 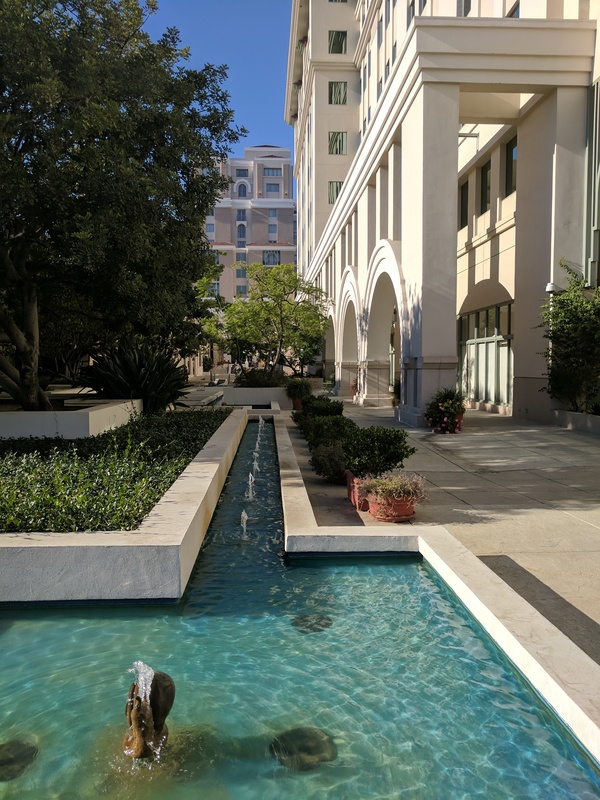 Second, Plaza Las Fuentes suggests that this arrangement and connection of public space, gardens, courtyards, and pedestrian passages from one block to the next defines a “Pasadena” architecture, not the stylistic clothing of individual buildings. Here, at least, we do NOT have to pay for the public life.